Ahead of round one, what are your club's big unanswered questions? For the Magpies' season preview, read on below. Or, you can click here to read more 2017 season previews, with each club's pass mark, coach pressure ratings, your predictions and more. Daniel Wells has battled calf soreness for more than a month after returning to pre-season in less than ideal shape. Likely to miss round one but when fit he's a silky addition. Jamie Elliott suffered an ankle injury soon after playing the first JLT Community Series game and is touch and go for round one while Scott Pendlebury was rested due to Achilles soreness but will play the season opener. Jordan De Goey has been in the wars with a thigh problem following a toe injury, while Matt Scharenberg will be given time as he returns from an ACL operation. Can the backline hold up? The Magpies expect to improve with the changes they made during the off-season, backing system versus individual reputation. Ben Reid is a star while Lynden Dunn can lock down on an opponent and is also a booming kick. A range of mid-sized defenders can take up the slack, taking aggressive positions to rebound. Does too much fall on Darcy Moore's shoulders? Lachie Keeffe, Mason Cox and Jesse White are the other keys capable of playing forward but Moore does carry massive responsibility for a 21-year-old with just 26 games' experience. He is capable of handling it, particularly if Jamie Elliott and Alex Fasolo stay fit. 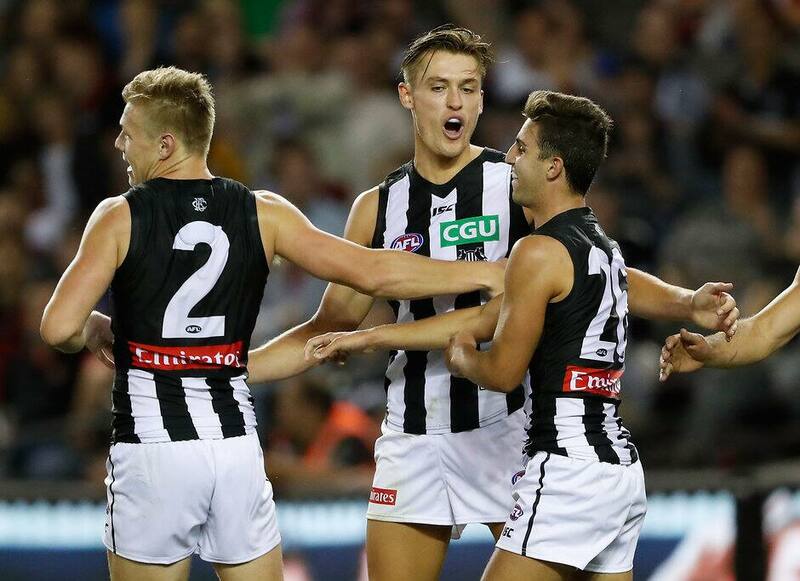 How good is Collingwood's midfield? Rated No.1 by Champion Data it has yet to prove it can consistently match it with the best within games and week after week. Scott Pendlebury, Adam Treloar, Steele Sidebottom and Taylor Adams are in the top tier but the rest remain as depth players. James Aish, Levi Greenwood, Jordan De Goey and Brodie Grundy are yet to regularly beat the best while Daniel Wells' reliability is questionable. Tom Phillips has had an excellent pre-season. Darcy Moore to become a star of the competition. Injury free and with reasonable delivery, the 22-year-old can become one of the most talked about players in the competition. Brave, possessing a huge leap and an accurate kick, supporters saw a glimpse of his talent against West Coast last season before injury struck. A tough start to the season, with defending premiers the Western Bulldogs followed by Richmond, Sydney and St Kilda. The Magpies must win two of the first four, while three will set them up. Their draw is relatively good with two games against Geelong, Hawthorn, Essendon, Melbourne and Port Adelaide. The Magpies should be in contention for a long time. Matt Scharenberg ($234,000) may not play in round one but expect him to play regular senior football in 2017 as he returns from his second knee reconstruction. He will begin to win the ball and should appear as a bargain basement selection by year's end. Chris Mayne will be straight into the team after arriving as a free agent from Fremantle, while the wait for Daniel Wells to appear is likely to be longer. Will Hoskin-Elliott shapes as a handy wingman/forward who could become a fan favourite as he has the capacity to do the spectacular. Josh Daicos had a nice cameo in the JLT Community Series but will have to bide his time while Callum Brown is back now after a bout of glandular fever. Nathan Buckley has declared it's finals or bust when it comes to his time at Collingwood. Entering his sixth season as coach after three consecutive years outside the finals, he has a talented list capable of being in the mix. Whether Buckley can make them jell will be known this season. Volcanic, to coin a phrase the Pies CEO made part of the football lexicon. Nobody at Collingwood is under any illusion that Buckley's position will come under scrutiny if the win-loss column isn't in his favour at season's end. They can get close to their best 22 on the park every week of the season. Ben Reid or Darcy Moore go down early. 11 wins. List should be ranked between seventh and tenth, so finals or just outside would be about par. Scott Pendlebury, No.4. Played under duress at the start of the year but won Collingwood's best and fairest for the third year in a row.